January 20 - WELCOME BACK PIZZA PARTY! February 3 - Alumni Panel. Guest speakers: Felisha McCullum and David Ehlers. 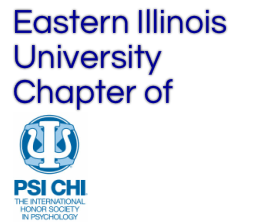 Come in with all of your questions for EIU alumni concerning surviving graduate school! March 2 - GRE information and nominations for next year’s officers. March 23 - Elections. Faculty and Student of the Year voting. April 6 - Service Day. April 19 (Tuesday) – Banquet. April 27- END OF SEMESTER PARTY! September 2- WELCOME BACK PIZZA PARTY! September 16- Graduate School Discussion Panel. September 30- Graduate School Application Discussion Panel. November 11- New Faculty Research Presentations. December 9- END OF SEMESTER PARTY! January 21st - WELCOME BACK PIZZA PARTY! April 29th - END OF THE YEAR PARTY! September 3- WELCOME BACK PIZZA PARTY! December 10- END OF SEMESTER PARTY!